Gout is a painful inflammatory condition that occurs in a significant number of adult men and women in Australia; and is increasing in incidence. Gout is related to high uric acid levels in the blood and can be influenced by genetic factors and diet. The increasing incidence of gout has been linked to the increasing incidence of obesity in Western society. Obesity (particularly abdominal obesity) and hypertension may be causal factors, due to an association between high uric acid levels, glucose intolerance or insulin resistance (and Type 2 Diabetes), high cholesterol levels and cardiovascular disease. It is important to address dietary and lifestyle factors in relation to these diseases for long-term prevention of gout. For short-term prevention of acute gout attacks, consideration of particular dietary components may assist in the management of your condition. High intake of protein and purine-rich foods have long been considered to be risk factors for the onset of gout attacks. New research reveals that it is more likely to be a high intake of meat and seafood proteins. Total protein intake does not seem to influence the onset of acute gout attacks, nor does a high consumption of purine rich vegetables. Consumption of meat and seafood should be kept to a moderate level. Most people should consume a palm sized serve (65-100g) of lean meat, once or twice per day. 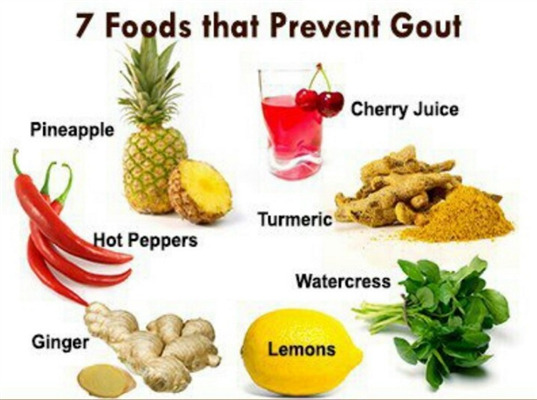 For people who are prone to gout, aim for a smaller serving, no more than once, or occasionally twice per day. Alcohol in any form raises uric acid levels but beer is particularly harmful and should be strictly limited in those with a history of gout. Fructose, particularly in the form of high fructose corn syrup (in soft drinks / sports drinks) will increase uric acid levels. The consumption of sugar-sweetened soft drinks is also strongly linked with an increased risk of gout. Intake of soft drinks and sports drinks should be limited as they are energy dense and nutrient poor. Water should be your drink of choice for many reasons. A low hydration status is a risk factor for gout, promoting uric acid crystal formation in the joints. One way to test your hydration status is the colour of your urine – aim for almost clear throughout the day. While some health professionals advocate for 2 litres of fluid per day, the amount your body requires depends on factors such as environmental temperature, activity levels and perspiration rate. Research has demonstrated that a high intake of low-fat dairy products (3 or more serves per day) can be protective against the development of gout. Diets high in vitamin C are also associated with a lower incidence of gout and seem to be protective against the development of gout by lowering uric acid levels. Some research has shown a compound called anthocyanins found in cherries, may be protective against gout through a reduction in plasma uric acid levels. This is a great reason to include a wide variety of fruits in your diet! So, if you suffer from gout you may benefit greatly by moderating your consumption of meat, seafood and alcohol. For example, one lean steak, less than the size of the palm of your hand, along with plenty of fresh vegetables and accompanied by one small glass of wine may mean the difference between an extremely painful gout attack or not. For the prevention and management of gout, diet and lifestyle factors need to be considered, paying particular attention to achieve a healthy body weight. References: Choi et al 2004 ‘Intake of purine-rich foods, protein and dairy products’ Arthritis and Rheumatism vol 52(1). Schlesinger 2005 ‘Dietary factors and hyperuricaemia’ Curr Pharm Des 11(32). Lee et al 2006 ‘Recent Developments in diet and gout’ Curr Opin Rheumatol 18(2). Choi et al 2004 ‘Purine rich food, dairy & protein intake’ NEJM 350. Wortmann 2002 ‘Gout and hyperuricemia’ Curr Opin in Rheumatology vol 14(3). Gout Causes. http://www.dietaryfiberfood.com/purine-food.php. McGill N 2009 ‘Treatment of Gout’ Geriatric Medicine vol 3.